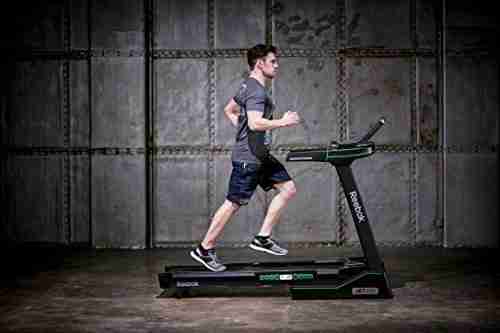 POSTS Reebok Treadmill Review – Which One’s Right For You? Reebok Treadmill Review – Which One’s Right For You? 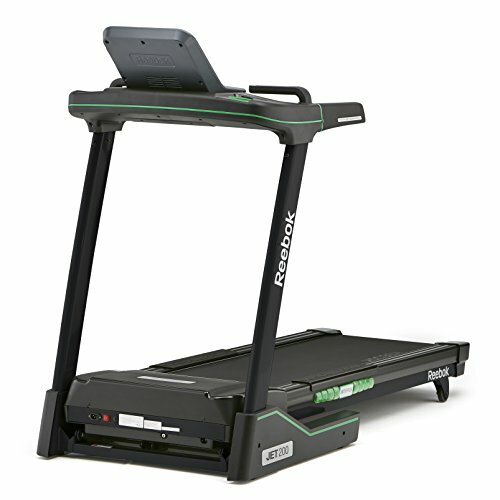 Are you interested in working out with a Reebok treadmill? They are a high-quality fitness brand that has been manufacturing sports equipment and clothing for years. So, many people are now interested to see how they fare in the treadmill industry. 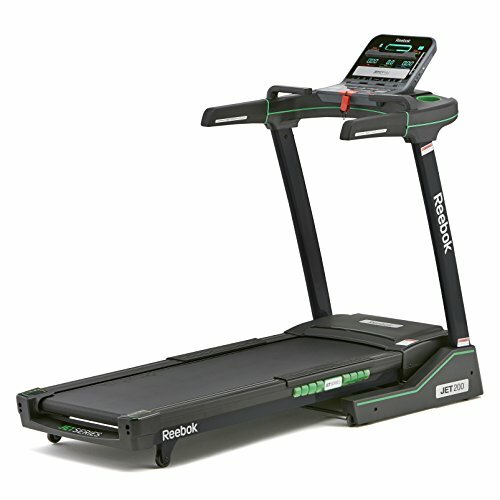 The Jet Series is their main model line and it includes three treadmills. Jet 100, 200, and 300. You can see our thoughts on the Jet 100 here. But what about the other two models? Are any of them a good fit for you? 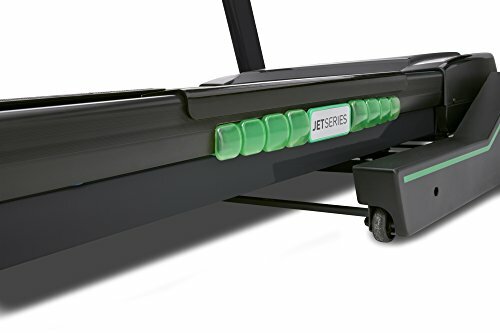 As a treadmill user myself, and someone who’s always after a good bargain, I would recommend the Jet 200 for most people. The Jet 300 is higher in price, yet both models offer very similar features and benefits. I found the Jet 200 to offer slightly less in comparison, but considering the price difference, I couldn’t justify spending almost double to have a very similar workout experience. Reebok’s Jet 300 model is equipped with a surprising number of great workout features. Most notably, I liked the cushioning tech, console design, and the variety of workout settings to keep things fresh. It has everything that I look for in a treadmill. Take a look below to learn more about the features it has to offer. The design of the console is what stood out to me the most. It features an LCD display that’s 5.5” large. The quality of the screen was better than I was expecting. It lets you see all of your workout statistic, including your distance, time, calories burned, speed, and heart rate. Therefore, you can easily see the areas for progression and improvement each time you hop on. Furthermore, there are a total of 29 workout programs to choose from. You can be sure to find the ideal workout program that suits your workout goals. You can also use the console to use the bodyfat analysis program. This gives you an estimate of your body fat percentage so that you can set goals for yourself on the percentage you want to achieve. Since these are treadmills to use at home, the transportation features are always something I keep a keen eye out for. I was glad to find that the Jet 300 is equipped with some fantastic mechanisms that make transportation effortless. There is a soft-drop system that operates on hydraulics. 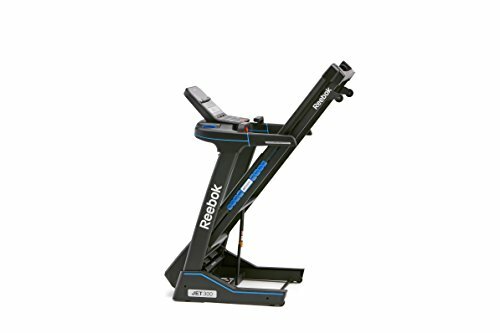 As result, you can fold this Reebok treadmill up with minimal effort. This hydraulic system also ensures complete safety. Once it’s folded up, you can then roll the treadmill to a more suitable area for storage. This is a result of the wheels that are located on the bottom. So, you can pull the treadmill out for working out, and put it back away into storage to save space. When it comes to treadmills, the incline settings are always an important aspect for me. It’s a feature that provides you with more options and challenges. 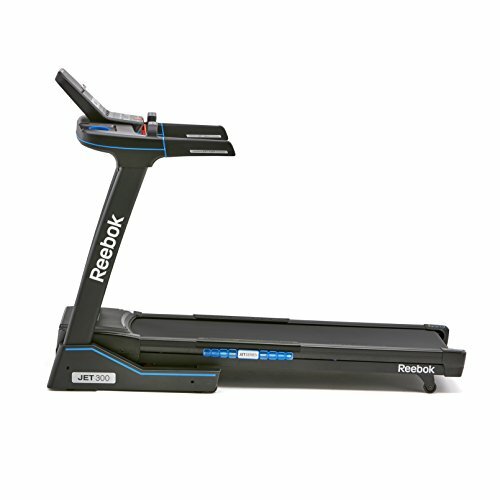 I liked how the Reebok Jet 300 treadmill comes with a total of 15 incline levels. Therefore, you’re able to set the incline to more specific heights for a customized workout. These incline settings can be used as a way to make your workouts more difficult. As you know, the harder it is, the better the results are. In addition to the incline, you’re able to experience top speeds of up to 12.4 mph. These speeds are powered by a 25 HP motor. While it’s not fast enough for sprinters, it is most definitely enough for those looking to get fit and lose bodyfat. The fact that there are 15 levels of incline also means you don’t necessarily need extremely high speeds to get a good workout. You can turn the incline up and jog for a gruelling and effective workout. Listening to music while working out is something I love doing. It helps me get into that focused zone. 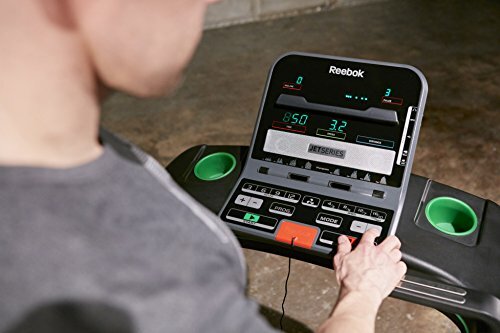 I was happy to find that this Reebok treadmill has a built-in speaker and can connect with MP3 devices. You can easily connect your devices by using the USB port. I liked how you don’t have to wear any headphones as they can sometimes become annoying and get in the way. The speaker itself isn’t super loud. However, since the treadmill operates extremely quietly, you won’t be struggling to hear the music. The running deck itself is 59 x 20” large. This is a superb size for most people. But it’s not just the size that I liked about the running deck. 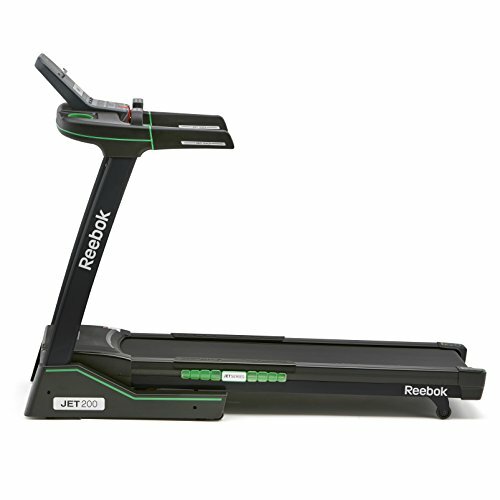 Reebok’s treadmill has been built with Air Motion Technology. What does this do? It uses suspension cushioning to ensure that you can run on the treadmill with a substantially reduced amount of impact on your joints. A common problem among people who run outside is bad joints. This is the result of continuously pounding the solid concrete floor. The knees end up taking a beating. This is something that can be avoided while using the Jet 300 treadmill. 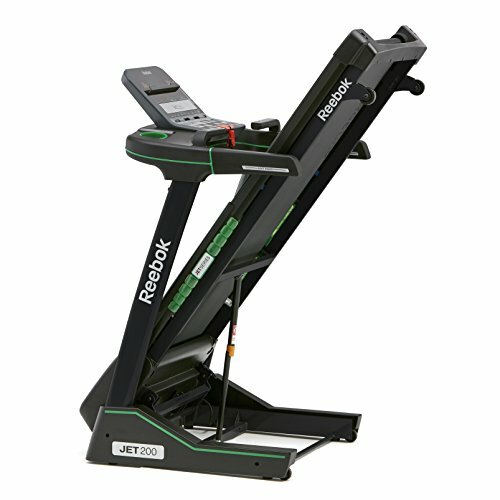 Reebok’s Jet 200 model is considerably less in price compared to the Jet 300. Does the lower price also mean a drop in quality too? Let’s find out below. The Jet series by Reebok all feature the Air Motion Technology. There are air pods beneath the belt of the Jet 200 that work to soften the impact on your joints while exercising. If you have bad joints that get worse on the hard ground, you’ll appreciate how soft this deck feels to run on. Having said that, it is also a beneficial feature for people who want to prevent any joint issues. I appreciate how the size of the running deck is excellent for most people too. It’s a little over 18 inches in width and 55” in length. Therefore, you won’t be running within a tight and uncomfortable space. This is often a problem with treadmills that you can use from home. The deck becomes smaller for a more compact size. So, I was happy to see they didn’t compromise on the deck here. The LCD display is 5” large and provides you with information on your workout stats. This includes data on your time, distance, calories burned, and heart rate. It’s a fantastic opportunity to clearly see the areas for improvement and progression for better results. Considering the lower price range, I didn’t expect the Jet 200 model to come with as many features. I liked how you can easily connect your MP3 devices to this treadmill to keep you motivated while you exercise. The built-in speakers mean that you can simply connect your device and listen to music, without having to deal with any wires. You can choose between a total of 24 workout programs. Again, I didn’t expect to have as many features available, considering the cheaper price of this model. This variety of programs means that you have a wide variety to pick from that fit your goals best. The equipped sensors also give you information based on the amount of fat your burning. You can even set targets for distance, calories burned, and time – all of which the sensors provide feedback for. With a soft-drop mechanism, you can be sure to safely and easily fold this treadmill up. I always find the folding feature of home treadmills to be incredibly important. They work to save you a lot of space. Therefore, you don’t need to create a room solely for working out. You can simply pull the treadmill out, use it, and fold it away back into storage. I liked how it comes equipped with wheels on the bottom too. This allows you to fold treadmill up and roll it away into a more suitable place to be stored. A 2.25 HP drive motor is used to power this treadmill. As a result, it can provide you with a maximum speed of 18 KM/H. For serious runners, this speed won’t be enough for a real challenge or chance for progression. However, for those looking to burn bodyfat and get fitter, this speed is more than enough. I say this because you can combine it with the 15 levels of incline available. For such an affordable treadmill, the incline features caught me off guard. 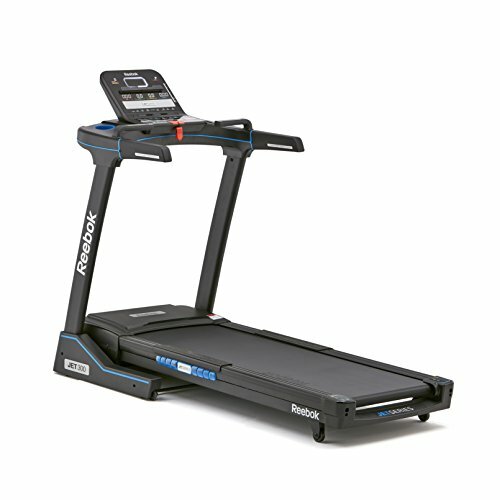 Many treadmills within a similar price range are only able to be so cheap as they skimp out on the incline features. With the Jet 200, you can jog/walk and set the incline to make your workouts tougher. Running uphill takes a lot more effort than on a flat surface. Now you know a little more about what the Jet 200 and 300 models by Reebok have to offer. So, which one is best for you? After weighing up all of the features, pros, and cons, I would recommend going with the Jet 200. The difference in quality between the two doesn’t vary a whole lot. So, you can save money by going with the Reebok Jet 200. The Reebok Jet 100 is the other model in this range that you may also want to consider too. Check out what made it our top pick in our Best Portable Treadmills review. Star Trac Spinner Review. Which One is Right for You? Spin Bike vs. Treadmill: Which One is Right for You? Best Weight Loss Belts: Which One Is Right For You? Intrepid i300 Treadmill Review– Is It Right For You? Schwinn Recumbent Bike 230 vs. 270: Which Is Right For You?